Standing by the church, a very important part of our heritage. The WI emblem is carved to the bottomleft, and the white cross of the Knights Hospitallers, to the right. Itwas commissioned by the Carbrooke WI, who raised funds for its creation, and alsofor the plinth it stands on. 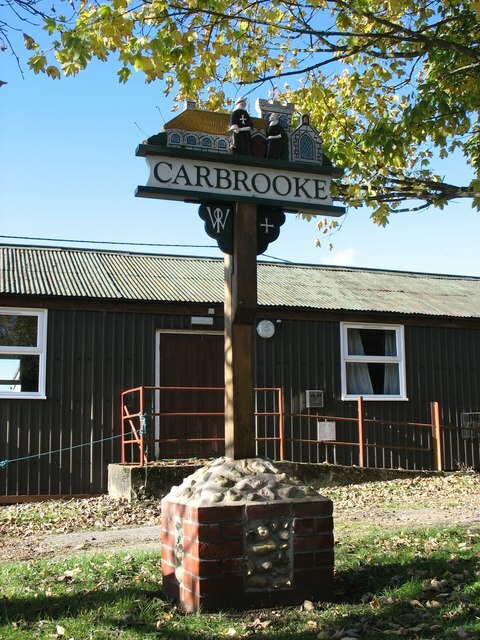 In the early 1990’s it was starting to deteriorate, and was repainted by some of the prisoners at HMP Wayland but about 7 years agothe sign had reached a point at which it could no longer be repaired, and so Carbrooke Parish Council, took the decision to have a new sign carved and painted.